Flooding in Victoria Terrace has been occurring for many years. The first reference in Kemnay Community Council minutes refer to flooding in 1977, but there has been some anecdotal evidence suggesting that serious flooding occurred even further beyond that date. This page is devoted to some of the information made available from experiences since 1977 when Kemnay Community Council came into existence. 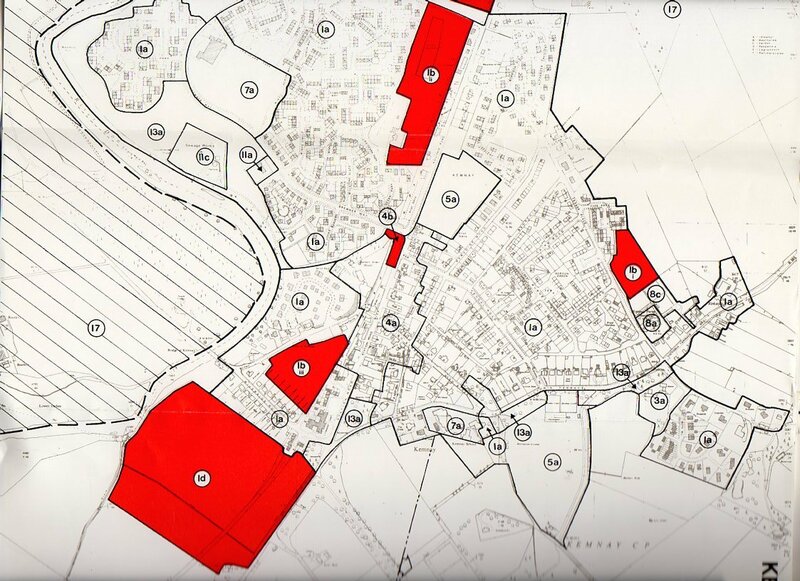 It is by no means comprehensive but it does provide some insight as to the history of development in this area of Kemnay and how it impacted on Victoria Terrace. The area shaded blue, on the 1959 OS map of Kemnay below, indicates roughly an area of farmland that has historically been prone to flooding. Some older residents have referred to this site as the unofficial curling pond but then again other folk have refuted this claim. It has however, indisputably been an area susceptible to flooding and at some time between 1980 and 1985, the owner of the farmland carried out extensive engineering works, grading, leveling and draining the site. However, during periods of heavy prolonged rainfall or during melting winter snows, the site continued to flood and the facility continued to be enjoyed by seagulls, ducks and on one brief occasion a pair of swans. Kemnay Community Council election time and Ally Stephen, owner of Kirkstyle Garage, joins the Community Council to raise the profile of the frequent flooding in his Garage, which is located in Victoria Terrace. 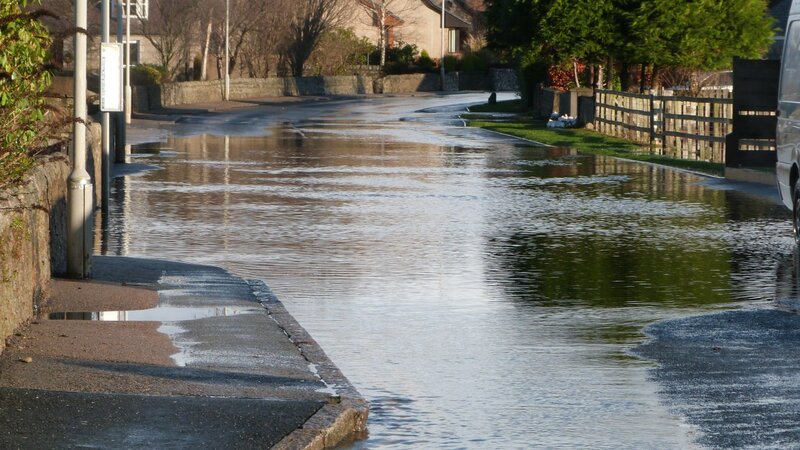 Former Grampian Regional Council, were on the verge of issuing a flood prevention order to resolve the serious flooding that occurred in Victoria Terrace. 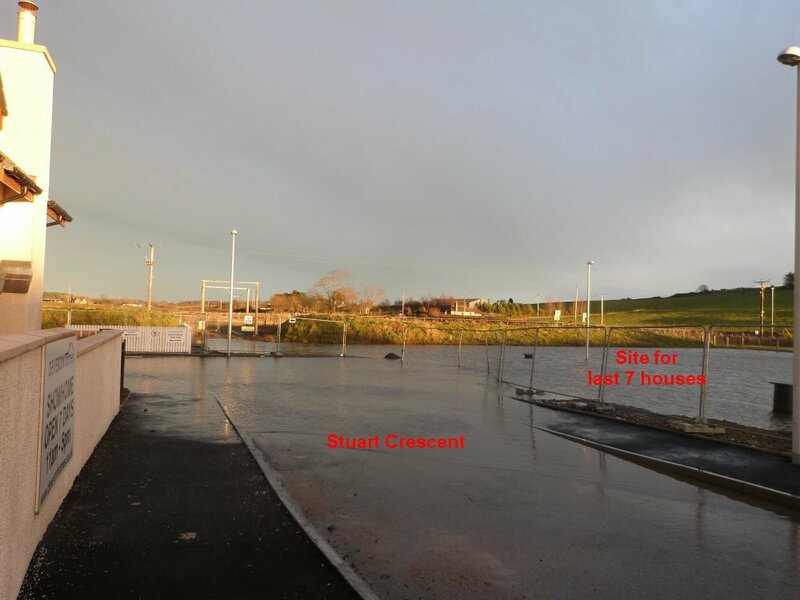 Site 1b(i) off Fraser Place is owned by Gordon District Council and zoned for 16 houses but is undeveloped due to to drainage constraints in Victoria Terrace. As requested, Mr Evans wrote a letter to Director of Planning on 06-03-95 to outline discussions that had taken place at the February 1995 KCC meting. 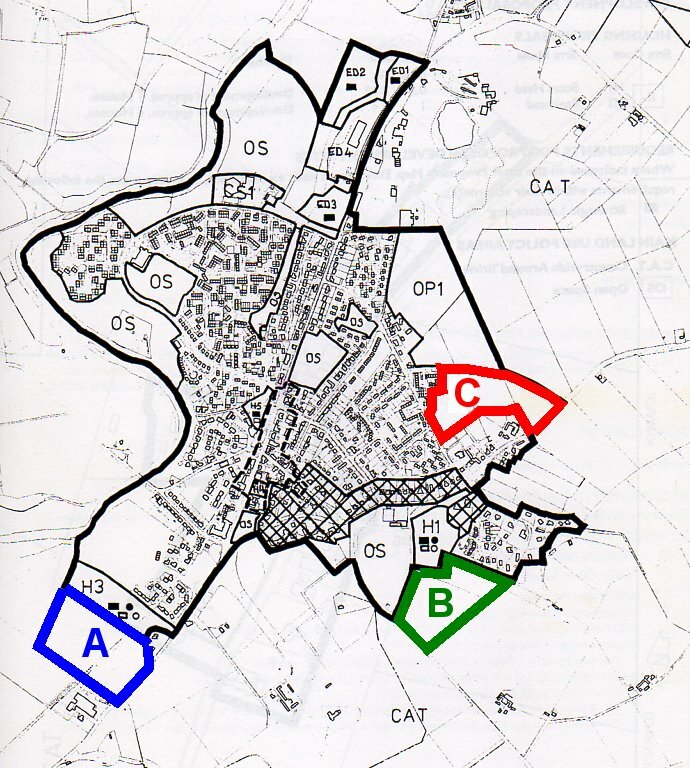 Kemnay Community Council (KCC), meeting 30 March 1995 (AGM), KCC consider Draft Local plan options site “A” Monymusk Road and site “B” Bogbeth Road. After discussion KCC write a letter to Gordon District Council on 31 March 1995 to confirm support for development of the site “A” at Monymusk Road. 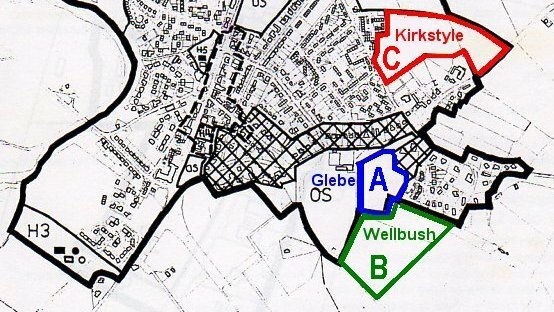 NB, at this stage the site “C” option at Kirkstyle had not been proposed by Gordon District Council. 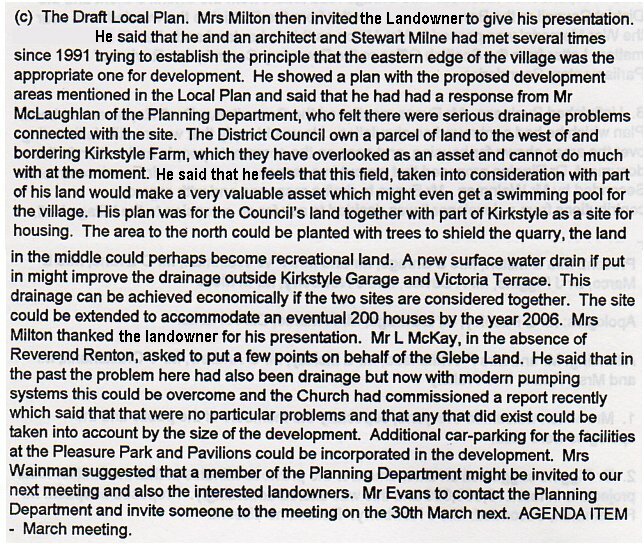 23 April, Letter from Landowner, Kirkstyle Farm, the letter refers to a report to KCC by David Evans at the Kemnay Community Council AGM Meeting 30 March 1995 and states “the additional cost (of the new surface water drain), would be borne entirely by the developer and not Gordon DC and the new surface water sewer would be planning gain for Kemnay. Kemnay Community Council meeting 27 April 1995, Landowner of Kirkstyle Farm addresses members regarding the benefits of developing his land for housing and shows photographs of the 3 possible development sites (A, B, and now Kirkstyle, shown as site C above). Landowner states that he is still in discussion with the Planning Dept. and also Fairhurst & Partners and he feels that development of his site would be of great benefit to Gordon District Council (GDC). The main benefit related to the proposed new sewer in Victoria Terrace. A new sewer, would not only eliminate flooding problems in Victoria Terrace, it would also enable development of the 16 houses at site 1b (i), Fyfe Park, which is owned by GDC. This site at Fyfe Park could be developed as part of a joint development alongside adjacent land to the east at Kirkstyle and would generate income for the Council as well as additional housing. Another stated benefit was that the present cul-de-sac Fyfe Park would be extended to join up with Victoria Terrace providing a better and safer access on to Victoria Terrace (the nearest access at Kendal Road is steep and dangerous in icy winter conditions. Report to Planning & Development Committee by Director of Planning, paragraph 4.5(c) states “The development of Kirkstyle Farm would necessitate the provision of a new surface water sewer for some 1200m. to the river Don. This infrastructure provision may give more flexibility for future development in Kemnay.” The Director goes on to state that he does not attach as much weight to criteria 4.5(c) as criteria 4.5(a) & (b). However criteria 4.5(b) refers to “Impact on the Environment”. 11 December 1995, letter from KCC to Mr E Hinds, Assistant Area Manager, Grampian Regional Council Water Services regarding 1,200 mtr. surface water sewer upgrading to serve development of Kirkstyle. During the course of the telephone conversation, Mr Hinds advised that the cost of the new surface water sewer would be in the region of £100 per metre. 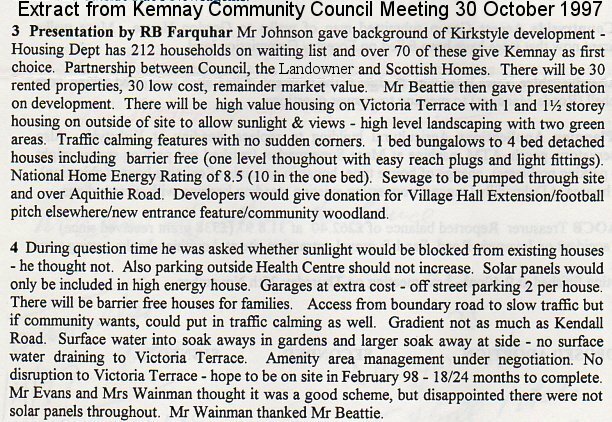 Kemnay Community Council meeting 11 January 1996. Presentation by the three competing Landowners who each made a case for KCC support for the inclusion of their sites in the new Local Plan. K.C.C. then voted on the three sites taking into account the substantial planning gain for Kemnay by way of a new surface water sewer. The result of the secret ballot was 3 for site A, 1 for site B and 5 for site C, Kirkstyle. Letter to Director of Planning dated 12 January 1996, supporting site C Kirkstyle. 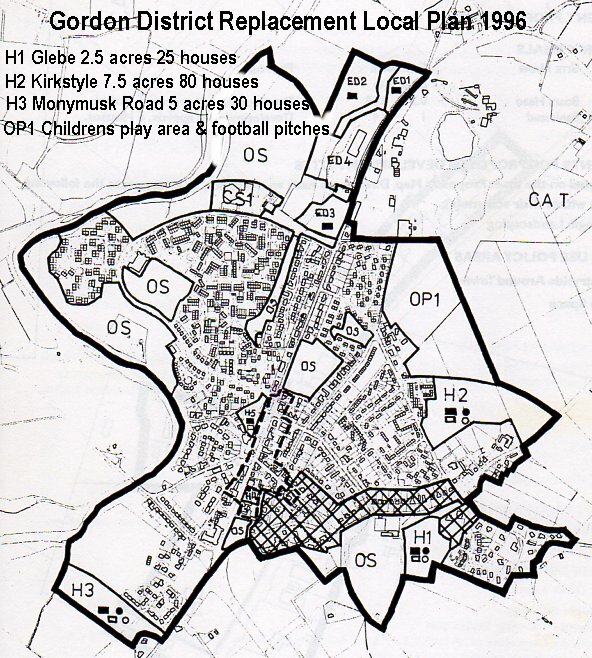 Later in September 1996, the finalised Gordon District Replacement Local Plan was published, which indicated Kirkstyle as site H2, 7.5 acres and zoned for 80 houses. Aberdeenshire Council Development Brief for Kirkstyle. Paragraph 5.1 DRAINAGE states “A major part of the site infrastructure will be the provision of foul and surface water drainage. A new sewer will be required, RECOMMENDED to be along B.993 Victoria Terrace, Grove Road, Riverside Road to the River Don.” Kemnay CC meeting on 27 February 1997, Mr Evans asked to write a letter to Aberdeenshire Council, to query increase in Kirkstyle site area from 7.5 acres in the Local Plan to 11.226 acres in the development brief, will this mean more houses than the 80 indicated in the Local Plan and why has the Local Plan site for a football pitch now proposed for community woodland. Letter dated 03 March 1997, sent to Director of Planning. The estate layout and design was generally considered to be good, especially the single storey courtyard in the south east sector of the estate. However, there were no new football pitches or donations to such and no village entrance feature. The present granite village entrance feature was provided much later circa 2010 courtesy of Glyn Jones, Factor for Breedon Aggregates, after a request by Kemnay Community Council. However, the community woodland has been a great asset to Kemnay, especially so because it enabled the later development of one of Kemnay’s most treasured landmarks, Place Of Origin. 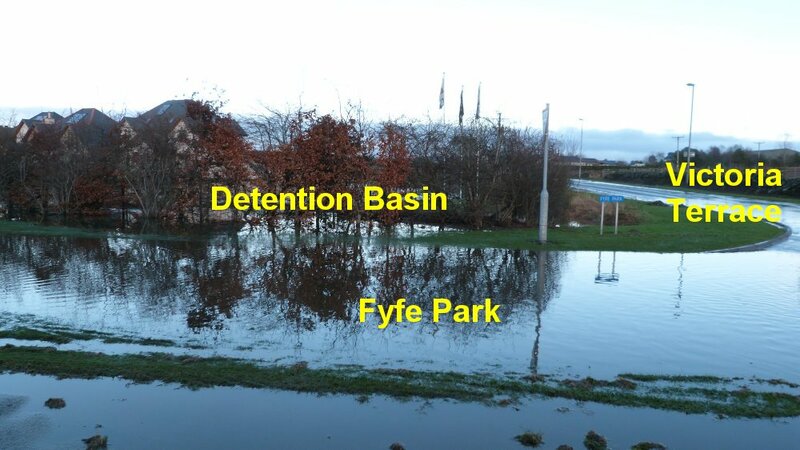 The larger soak away referred to is west of and on the edge of Fyfe Park. No surface water would therefore drain directly into the Victoria Terrace sewer, although it was argued at the time that all soak aways must drain somewhere albeit underground and unseen. 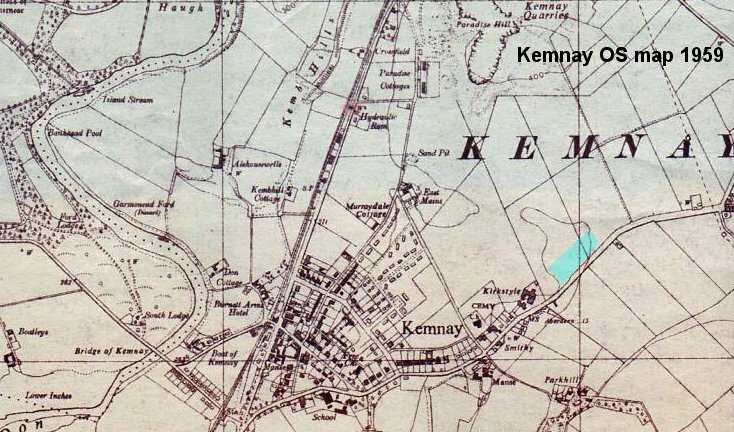 In periods of heavy prolonged rainfall it may well drain to the historical flooding area in the fields to the east, as shown shaded blue, on the 1959 OS map of Kemnay shown at the top of this page but there is no evidence to support this assumption. At Kemnay Community Council meeting 27 November 1997 A representative from R B Farquhar, Mr E Macleod was present and was asked how the proposed sewage pumping station would operate in the event of a power cut and he replied that a generator would be connected to the pump kiosk. Concern was also expressed about the long term efficiency of the proposed soak-aways. 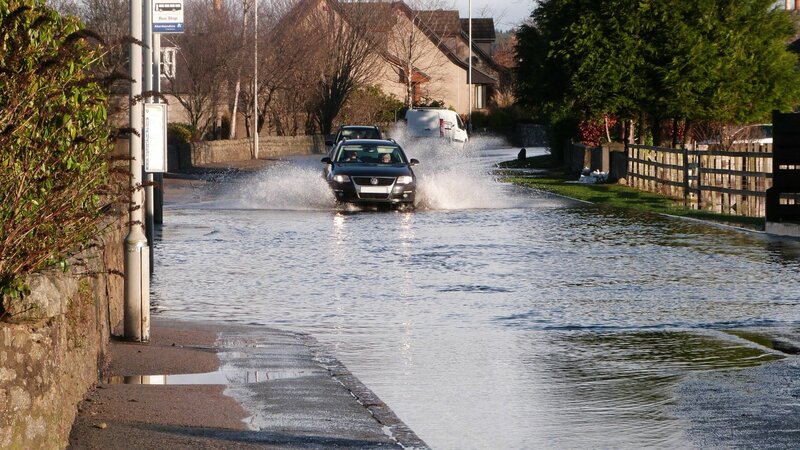 Mr Macleod replied that the soak-aways were efficient and complied with North Of Scotland Water Authority standards, he continued to say that fouls sewage would not be connected to the sewer in Victoria Terrace because of disruption and unquantifiable cost in connecting to old pipes. 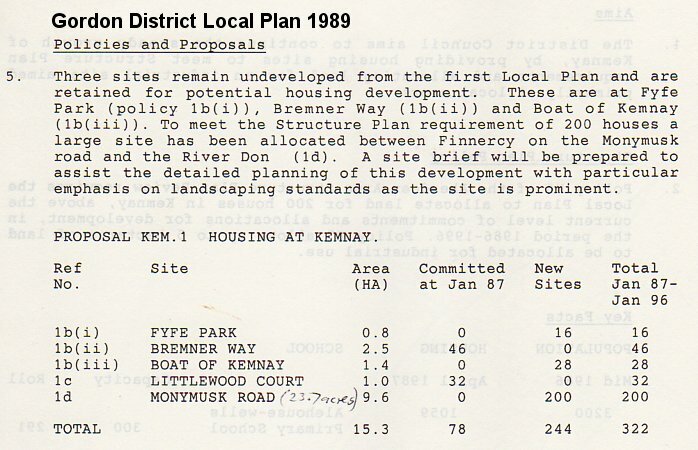 Kemnay Community Council meeting 26 February 1988, under item 4. unfinished business, it was hoped to hold a public meeting on 14 April to ascertain the exact type of drainage planned and who is ultimately responsible for the system. 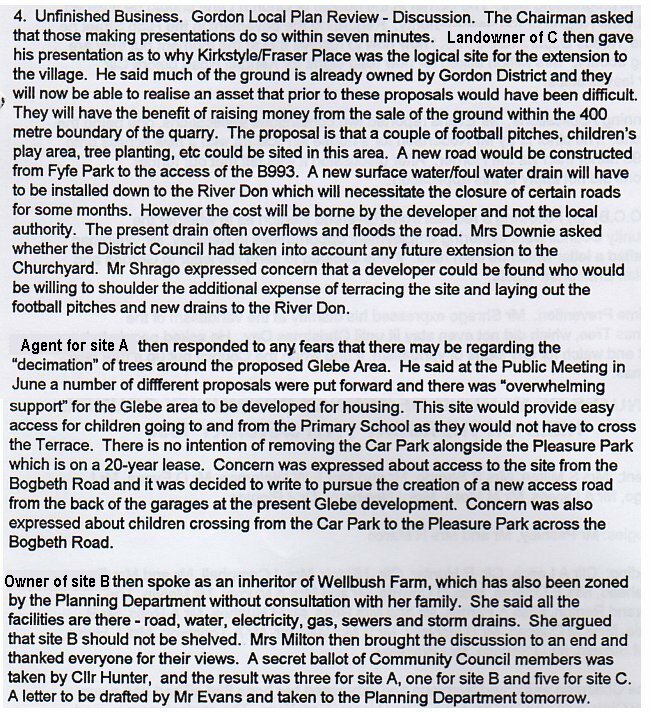 The letter also contains a report outlining a brief history of flooding issues in Victoria Terrace and the background to the development at Kirkstyle and states that the new sewer was consistently referred to as being part of the planning gain attached to the eventual development of the site at Kirkstyle. 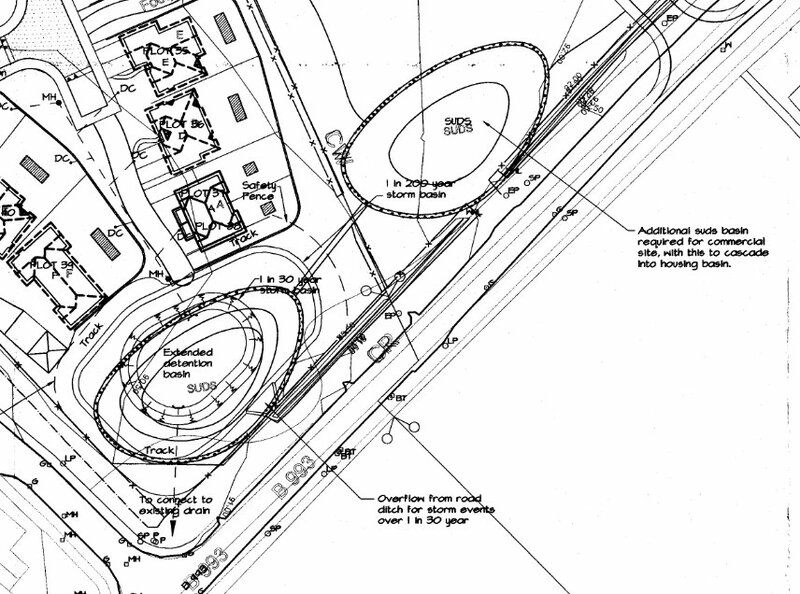 If the planning gain promise of a new surface water sewer had not been included at the outset, then in all probability Kemnay Community Council would NOT have voted in favour of developing this site. 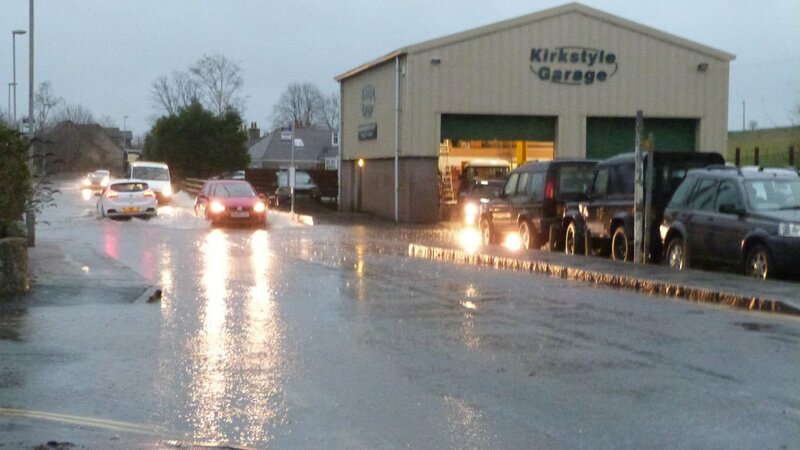 After Kirkstyle Phase I was completed, Victoria Terrace continued to experience flooding during periods of prolonged rainfall due to the road gullies not being able to cope with the quantity of surface water. 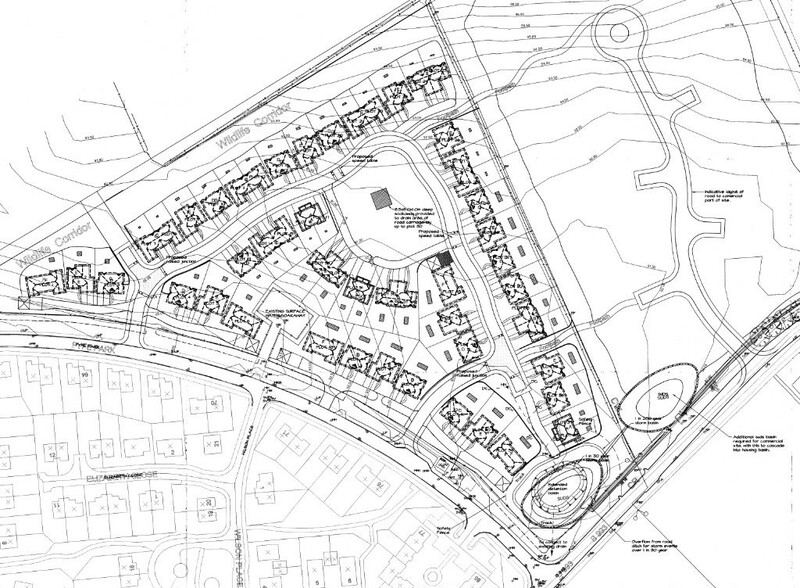 In 2010 Fyfe Park Phase II commenced, a development of 54 houses, located east of Fyfe Park. APP/2007/2474. 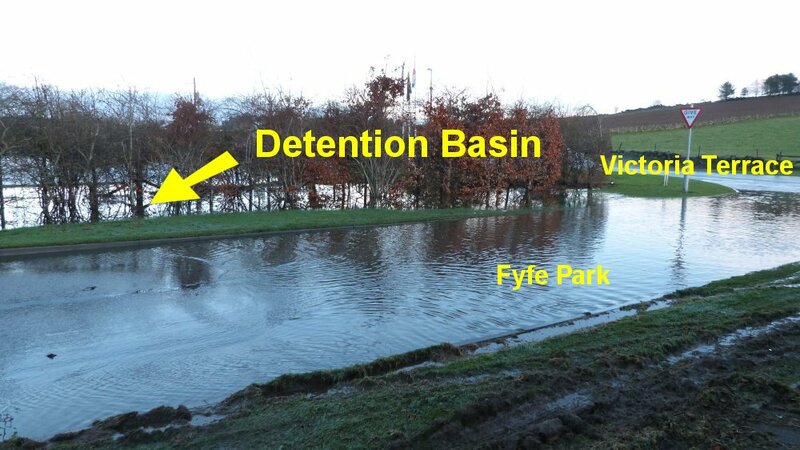 Foul sewage was pumped north over the hill but surface water was drained by Sustainable Urban Drainage System (SUDS), which meant that surface water drained to a Detention Basin (DB), south of the site adjacent to B993 / Victoria Terrace. Another DB was proposed to the east to cope with surface water from a proposed commercial development site to the east of the housing development, the industrial DB was to drain into the residential DB. In December 2013, prior to completion of this development, there was serious flooding of the lower southern part of the site. At the time, unusual weather conditions prevailed, the ground had been frozen solid for a prolonged period, which was followed by prolonged heavy rainfall. The frozen ground conditions could not absorb the rain, which just drained down the hill and accumulated in the historically flooded area adjacent to the B993. 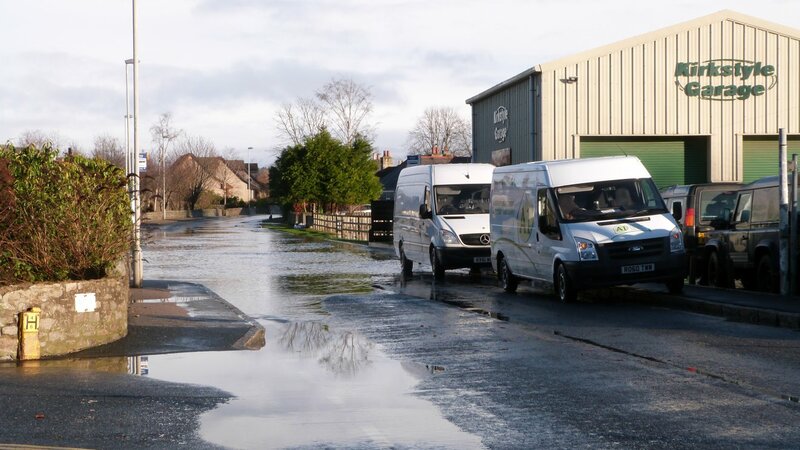 Storm Frank arrived on 7 / 8 January 2016, causing the River Don to burst it’s banks and resulting in extensive flooding in various parts of the village. The inadequate sewers in Victoria Terrace (the surface water sewer was partially obstructed) could not cope with the prolonged heavy rainfall and surface water could not drain from the DB which resulted in the DB overflowing and flooding the B993, Fyfe Park and Stewart Crescent. It is open to opinion as to where the blame lies but the landowner merely sells the land to the Developer Deveron Homes who have an approved planning consent for the proposals which were approved by Aberdeenshire Council, with no objections fro Roads Dept., Scottish Water or SEPA. 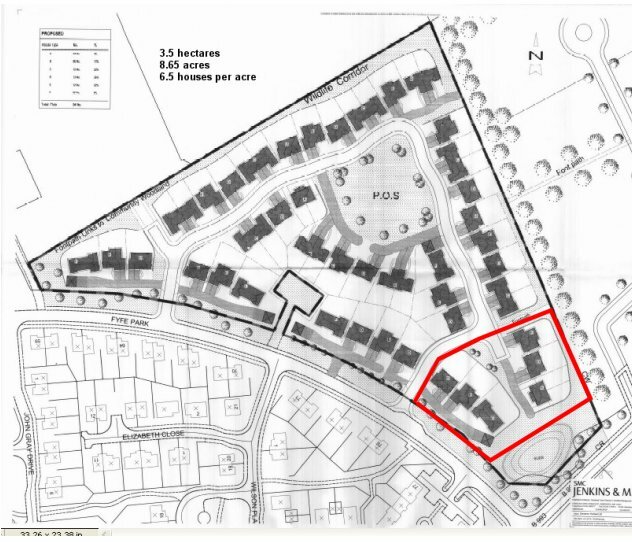 Kemnay Community Council did object to the development but largely on the basis that the site was zoned in the LDP for 20 houses and yet the proposal was for 54 houses and at the time no one had the expertise to legitimately challenge the SUDS proposals, which were supported by SEPA. Clearly, from the outset, it has been acknowledged that the sewers in Victoria Terrace are inadequate and yet development was allowed to proceed on the basis that a SUDS could mitigate any flooding. It is quite obviously not the case and even more disappointing is that no one is willing to take any action to resolve the problem. Aberdeenshire Council deny responsibility, Scottish Water own the sewers but refuse to take any action to permanently clear the obstructions or renew what must be deteriorating inadequate infrastructure. SEPA, who advocate and encourage SUDS, just sit on the fence and write lots of reports and produce 6 year plans using historical data based on what “might” happen in multiples of 100 years. 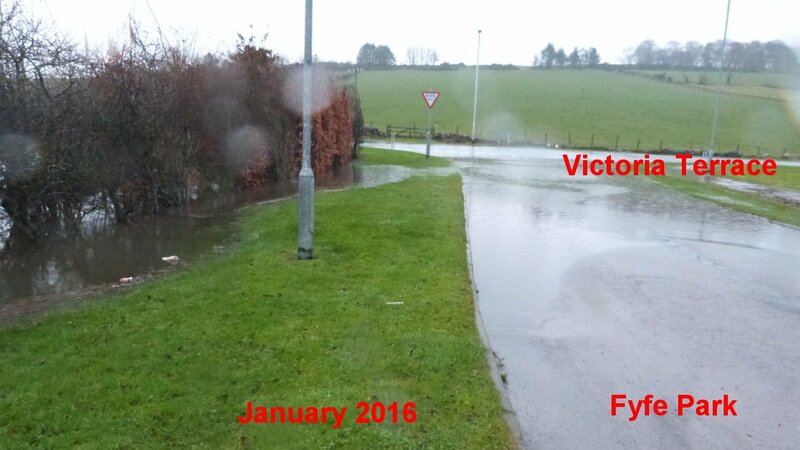 After Storm Frank in January 2016, despite the fact that Kemnay suffered substantial flooding, Aberdeenshire Council refused to take any preventative action because SEPA has not designated Kemnay as being a Potential Vulnerable Area (PVA). 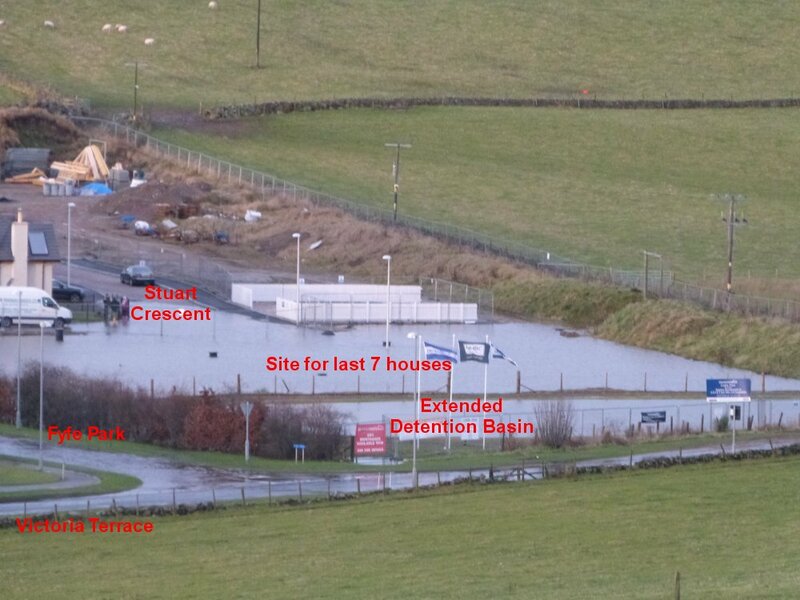 Although SEPA admitted that given the evidence provided by Storm Frank, Kemnay should be designated as a PVA but … yes there is always a but … SEPA only published their Strategy for the North East Local Plan District (SNELPD), in December 2015 and the SNELPD is only updated every six years … so Kemnay must wait until 2022 before it can be considered to be a PVA! In theory, the whole of Aberdeenshire could be wiped out by a Tsunami tomorrow … but SEPA could not acknowledge it until their new SNELPD begins in 2022. All Plans should be dynamic with built in flexibility to react and cope with changing circumstances, especially in a period of acknowledged “climate change”. In 2018, after considerable pressure from members of the community, SEPA finally designated Kemnay as being a PVA. 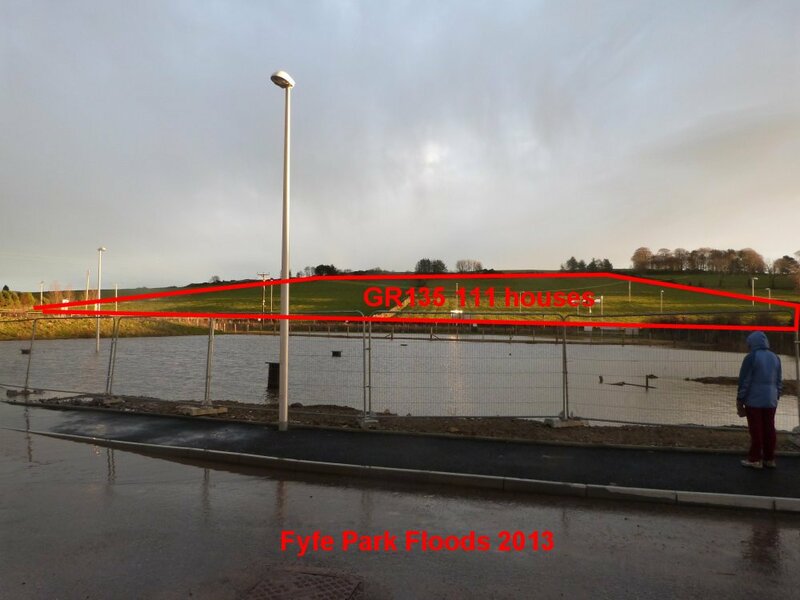 Certain “stop-gap” emergency equipment has been provided to mitigate any future flooding at Milton Meadows and Kembhill Park but no flood prevention works have yet been implemented or even designed. In Victoria Terrace, the situation now in April 2019, is that no drainage maintenance or improvement works have been implemented and a Local Development Plan bid has been submitted for an additional 111 houses on a site identified as GR135 Option 2, that would drain into the sewers in Victoria Terrace. It is envisaged that Victoria Terrace will be renamed Venice Terrace.